Tropical Cyclone Winston struck Fiji Saturday February 20th as a category 5 storm. (A Cyclone is the same thing as a Hurricane except it is in the Southwestern Pacific Ocean). A category 5 Tropical Cyclone (like Winston) has winds in excess of 155 mph (249 kph). Tropical Cyclone Winston was the most powerful storm on record in the Southern Hemisphere having winds that actually reached 184 mph (296 kph), authorities have said. Fiji is made up of over 330 islands and 500 islets with 110 permanently inhabited islands. 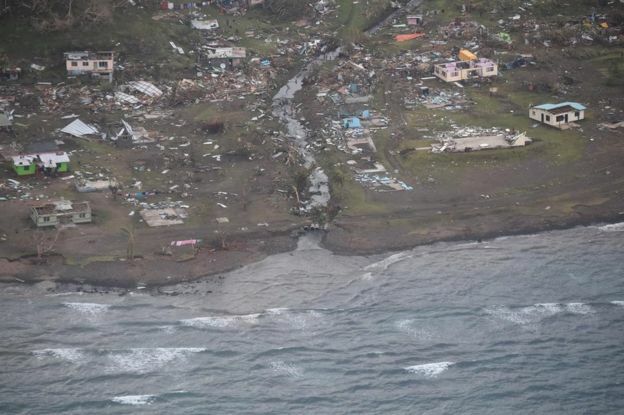 The vast majority of Fiji’s 860,000 residents live on or near the coasts of those islands leaving them extremely susceptible to the ravages of a Tropical Cyclone. Many of the inhabitants of Fiji’s small islands live in small villages that are much the same as they have been for thousands of years. Many of these villages have sustained tremendous damage and some have been entirely flattened. The Fijian Prime Minister has declared that many Fijian villagers have no access to clean drinking water, and many do not even have a roof over their heads after the impact of Tropical Cyclone Winston. Torrential rain and 40 ft waves devastated many coastal villages in Fiji. Officials being deployed to check on some of the more remote communities are reporting “Grim images of devastation”. The death toll due to Tropical Cyclone Winston has reached 42, but the Red Cross has warned that the toll could still rise further as not all remote communities have been contacted in the wake of the storm. Technology over the past few decades has truly shown us that we are all one global community and it is times like these that we need to act like one. The people of Fiji need our help rebuilding their villages and lives. Turtle Island (a luxury resort in Fiji’s Yasawa Islands) has set up a GoFundMe page to raise money to help villages in the Yasawa Islands. They have already order $50,000 FJD worth of supplies to aid these villages and are looking for donations of $80,000 FJD in total (that is about $38,000 USD). If you would like to help, check out Turtle Islands page about the campaign here, or click the donate button below to go to the GoFundMe page directly.